Andrew says that, from a young age, he felt called to be a priest, but became self-conscious about it during high school. Later, as a business and finance major in college, he realized that call was still there, waiting for an answer. And then, he says, “On summer break after my sophomore year of college, I talked with the pastor of my home parish at a barbecue. He was the first person I ever told that I thought God was calling me to be a priest. I have been in my diocesan seminary program for two years.” In summers, Andrew says, he has been involved in the “Totus Tuus” program. Ryan says his greatest influences have been “my family, my parish priest and music. My family has always been close; Sunday afternoon gatherings were frequent, and their love and support has meant the world to me.” He grew up a block from his grandparents and often stopped by after school for a game or a snack with grandpa. John grew up in Tulsa, Oklahoma, the oldest of four, and was an altar server and Eagle Scout; he received the John Henry Newman Award for excellence in faith, leadership, scholarship, and service. He has studied computer engineering and electrical engineering and worked as a systems administrator for a manufacturing company. During college, he took an active role in Catholic campus ministry – taking classes, going on pilgrimages, even helping to build houses for the poor in Guatemala. John’s call to the priesthood came into focus at the funeral of the priest who prepared him for his confirmation, during an inspired homily. The death of John Paul II, a hero of his even during times when his faith seemed less important, came only six weeks after the death of his aunt. Then came Joseph’s “lightbulb moment”: during noctural Adoration while on retreat, Joseph – alone in the chapel – heard, “You keep looking for a direction; why do you keep running?” That night, Joseph made his first confession in a decade, and that fall he entered the seminary. Joseph says he has especially prayed to be able to visit the tomb of his confirmation patron, St. Peter – a prayer that will be answered affirmatively during the Rome Experience. Born into a military family, Jean-Francois has lived in several different Canadian provinces. With degrees in political science and international relations, he has assisted the needy in Quebec City, served as padre to an army cadet summer training camp, and taught adult catechism classes. Jean-Francois says he has felt a strong call to the priesthood since 2005, especially after the death of Pope John Paul II, and sees the Rome Experience as a “unique privilege” of benefit to his future service in his archdiocese. Gilbert was born in a village in Tanzania. After secondary school, he says, he joined the Congregation of the Precious Blood., followed by several years studying philosophy, theology and neuro-linguistic programming. 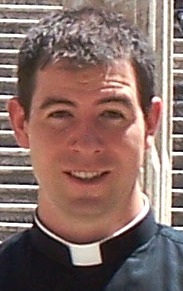 In September, 2008, he joined the Archdiocese of Chicago and is now a seminarian at Loyola University. Samuel describes his family as supportive of his vocation, though “largely unchurched and religiously non-practicing”; he says he has felt a calling since high school. Samuel says he prays, with Our Lady, “Fiat mihi secundum verbum tuum,” and was deeply touched during a visit to New York to see Pope Benedict XVI during his first apostolic voyage to the United States. Accompanied by brother seminarians, Samuel recalls the Holy Father’s words on that occasion: “The People of God look to you to be holy priests, on a daily journey of conversion …. Strive for a pattern of life truly marked by charity, chastity and humility, in imitation of Christ, the Eternal High Priest, of whom you are living icons.” Samuel hopes the formation promised by the Rome Experience will assist him in becoming such a living icon. Oklahoma-born Jayd has a bachelor of arts in philosophy and spent several years in a religious community before embarking on studies for the priesthood through the Diocese of Nashville, Tennessee. It is is a year of milestones for Jayd, who will be joining The Rome Experience with a newly-awarded master of divinity degree from Notre Dame seminary in New Orleans, and will be ordained a deacon later in 2009. All this is preparation for his anticipated ordination to the priesthood in 2010. Raised in a house built by his carpenter dad, Ryan recalls an imaginative and happy childhood. He credits Catholic elementary school with being much more academically challenging than his subsequent public school experiences. An active Boy Scout, Ryan was good at swimming and running, was a drummer in marching and concert band, and parlayed his well-rounded interests and high grade-point average into a full-tuition scholarship to college, where he majored in both mathematics and Spanish. It was during college, he says, that his faith began to blossom, and during this time he discerned his vocation. Born in Nyamira, Kenya, 33-year-old Thomas is currently a student at St. Joseph College Seminary in Chicago, Illinois. He tells us he believes “The Rome Experience” will be a helpful preparation for his future life as a priest, and finds the schedule of classes and the initial spiritual retreat appealing. Richard is in seminary in Florida; before that, during college, he says he worked as a handyman, parish youth director and cemetery maintenance man (not all at the same time). Many members of his parish encouraged him to consider a vocation to the priesthood. Richard says he is “immensely grateful” for being chosen for the Rome Experience, as well as for the scholarship he received to do so. “I look forward with joyful anticipation to share with fellow seminarians and priests the love of Christ, the history and culture of the Eternal City, and the formation available” this summer. After living as a Catholic for some time, Bryan was struck by something his parish priest asked in a homily: “Have any of you young men ever thought of what God’s plan for your life is?” Initially, Bryan thought of a calling to the priesthood only in terms of what he would have to give up! But after much prayer, he entered a religious order. Three years with the order brought many graces, but eventually Bryan moved on to seminary in Ohio to study for the priesthood in Lake Charles, Louisiana. Call him “Coach?” A former altar boy, Nicholas was in sports year round, and describes himself as “ultra competitive”. Born in Omaha, Nicholas has four older brothers and a younger sister; he praises his parents as “good examples of fidelity in their marriage, and to the Catholic faith.” During high school he was part of two state champion teams – one baseball, the other football! He played Division I football in college and achieved his dream of coaching a college team, but soon realized he had been running away from a call to the priesthood. Nicholas is now in his second year of theology studies at seminary in Detroit.